Between injuries, workouts, the final Derby preps (if you want to call them that), and other happenings, not unexpectedly there was an overload of Derby news last week. Though it didn’t go unnoticed, there was one potentially major story that probably did not receive the attention that it deserved. Last Saturday, the connections of Trinniberg went against their original plans and decided that the Teuflesberg colt will indeed run in the Kentucky Derby. For a horse that has about as much chance as winning as I do, the ramifications of that decision may play a major outcome in the eventual winner of the 2012 Derby. If you think that is an overstatement or I’m making too much of it, I’d like to take you back to both the 2001 and 2005 Kentucky Derbies. In both of those races, there were front-running horses that changed the entire complexion of each of them. I’m of the opinion that Trinniberg’s presence could have the same effect this year. In 2001, Songandaprayer came into the Derby off a win in the Fountain of Youth and a runner-up finish in the Blue Grass Stakes. He was sent off as a 35-1 longshot but still deserved a chance—after all, he had four two-turn races under his belt heading into the race. 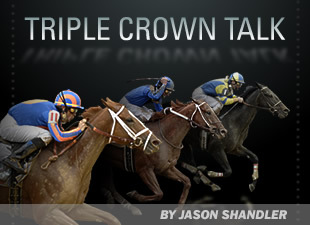 What wound up happening, however, changed the course of the entire race, and may have cost us a Triple Crown winner. With Aaron Gryder aboard, Songandaprayer broke like a shotgun from post 1 and proceeded to run the fastest half-mile (:44.86) and three-quarters (1:09.25) in Derby history. The end result was that anyone within five lengths of him early on had no chance of winning, including 9-5 favorite Point Given, who was sitting way too close under Gary Stevens and flattened out to finish fifth. Meanwhile, Monarchos, who raced in 13th through the early going, received the perfect ride under Jorge Chavez and picked up all the tiring horses in the stretch to win in 1:59.97, the second fastest time in Derby history. The rumors that John Oxley and John Ward sent Gryder a generous gift basket after the race have never been confirmed. In 2005, a gelding named Spanish Chestnut, entered in the race as a rabbit for Bandini, came into the Derby off a win in the one-mile San Rafael and three unplaced, two-turn Derby preps after that, including a tiring sixth in the Blue Grass. In the Derby with Joe Bravo aboard, he ran ridiculous early splits—:22.28 opening quarter, :45.38 half-mile, and 1:09.35 three-quarters, which was the second fastest six furlongs in Derby history. Like Songandaprayer, he changed the complexion of the race. Nobody that ran with Spanish Chestnut early on finished any better than seventh, including favored Bellamy Road, who was third after the opening quarter, and wound up finishing seventh under Javier Castellano. The race set up perfectly not for Bandini, but for 50-1 Giacomo, who was 18th after three-quarters and came flying down the center of the stretch to pull the shocker. Afleet Alex, also running from off the pace in the early going, received a heady trip from Jeremy Rose but may have moved just a tad too soon and wasn’t quite good enough when finishing a close third. To this day, Jerry Moss and John Shirreffs, it is rumored, send Bravo, and owners Derrick Smith and Michael Tabor annual Christmas cards. Both Songandaprayer and Spanish Chestnut had at least four two-turn starts on their résumés heading into their respective Derbies, and though they were longshots, they had every right being in the races. Jockey error, at least in the case of Songandaprayer (Bravo was probably given explicit instructions), more than anything was what contributed to the ridiculous paces and changed the outcome of both races. In the case of Trinniberg, I must ask, why is this horse being pointed to this race? He has seven starts in his career, none of them longer than seven furlongs. There is no question that he is a quality horse, but is clearly a miler-type and his presence in this Derby could have a profound effect on the outcome, not unlike 2001 and 2005. Consider the following quote from owner Shivananda Parbhoo made last Saturday: “With (Secret Circle) out of the race, I know there isn’t another horse in the race with the kind of speed my horse has. We’ll know after the first half-mile what the result will be. We’ll know, the jockey will know, and the rest of the field will know. I'm not worried about anyone else in the race if my horse gets in front." Is there any inkling of a doubt what the plan for Trinniberg will be? If you try hard enough you can already hear Parbhoo's instructions to Willie Martinez in the paddock: “Run him as fast as you can, for as long as you can, and we’ll see what happens." In looking at Trinniberg’s PPs, there is no doubt that he is a fast horse. In the Breeders’ Cup Juvenile Sprint he ran a ridiculous :20.96 quarter-mile at Churchill Downs before finishing a tiring seventh. With the exception of his last race in the Bay Shore, in every one of his races he has run his opening quarter in under :22 3/5 and a half-mile in under :46 1/5. In the majority of those races he ran :45 and change. Granted, the horse is in good form. He won the March 10 Swale by six and the April 7 Bay Shore by three, but they were both at seven furlongs. Somehow, the connections are actually under the illusion that a horse that has never gone two turns in his life will get the early lead and take this field wire-to-wire. Apparently, everyone else in the world knows it’s not possible, but they are going to try it anyway. I have no idea what the eventual outcome of Trinniberg’s presence will ultimately be. Maybe he’ll break poorly and he’ll be a non-factor from the start. But there is certainly the possibility that this horse is going to go out and run :22 and change, :45 and change and 1:09 and change. He might even still have the lead after a mile. Who knows? But one thing is for sure: If he runs as fast as he has been, anyone within a few lengths of him will be severely compromised, and it most certainly will give horses running from off the pace a much better chance. Kentucky Derby 138 might very well be shaping up to be a rider's race. Yeah, you’ll need the horse, the trip, and some luck, but The Trinniberg Factor will make it that much more important for a heady rider to judge what is shaping up to be a very fast pace.